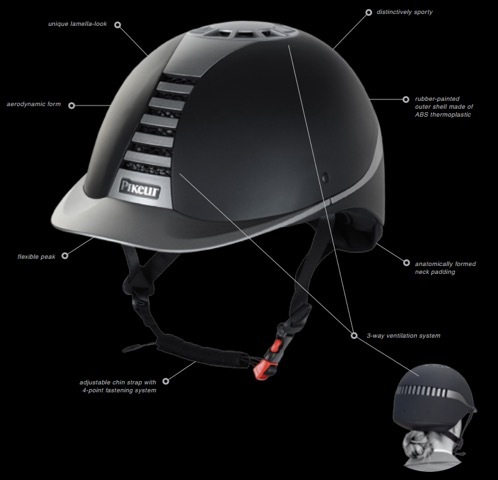 ​The new ProSafe Classic and ProSafe Excellence riding helmets by PIKEUR provide an ideal combination of safety, comfort and design. Just to be sure: the new riding helmets are EN-1384-TUV tested, with rubber-painted ABS outer shell, anatomically formed neck padding, an adjustable chin strap with 4-point fastening and in-moulded edge protection for optimised rigidity at the sides to ensure an optimum level of safety and reliability. These helmets are not only pleasant to wear as a result of the innovative 3-way ventilation system for excellent air circulation, memo-foam and exchangable, washable inlet made of Coolmax, they are also unique in their design: sporty,with lamella-look, aerodynamic form and flexible peak. This is why top riders wear PIKEUR safety riding helmets. Elastic, breathable & machine washable. Highly functional material with excellent grip. Very supple and durable with velcro fastening. Often imitated, but never equaled: The ROECK GRIP developed by ROECKL is the unmistakable original. In fact, its uniqueness is clearly tangible. As is often the case, it is the details and especially the materials that make all the difference. ROECK-GRIP is an exclusive material. It is extremely breathable, elastic and supple. In short: It fits like a second skin. At the same time, it ensures excellent grip and tactility for handling the reins. In order to guarantee the ideal fit, ROECKL uses classical French glove sizes. With sizes ranging from 6.0 to 11.0, that makes eleven sizes per color – every equestrian is sure to find the perfect glove to meet their needs. The Munich-based glove tailors also attach great importance to the manufacturing quality: The individual pieces are meticulously sewn together by hand. Seam tolerances of max. 1 millimeter are merely a tangible quality criterion, because comfort cannot be measured. The secret lies in the cuts and proportions. This is where ROECKL draws on 175 years of experience in the art of glove tailoring. Convenient: The ROECK-GRIP is machine-washable at 30° Celsius (86° Fahrenheit). The characteristic fastener with the stylized hand logo reliably secures the glove around your wrist.